it is a botanical plant – known locally as ‘vettiver’ of grass family. Sometime back, plantation of vettiver grass to check soil erosion was renamed as Sabujayan project by West Bengal Chief Minister Mamata Banerjee. Kasturi Ghosh, a gold medalist from Bidhan Chandra Krishi Viswavidyalaya,is doing PhD on Chief Minister's project. Ms Mamta had inaugurated the project at a function in Nadia in 2015. Vetiver grass is being planted along the riverside for protection of the river embankment. The Nadia district administration brought Sabujayan Project under the Mahatma Gandhi national Rural Employment Guarantee Act. The grass has deep roots and can prevent soil erosion during heavy floods. Additionally, it shows high level of tolerance to toxic levels of salinity, acidity, alkalinity, and a whole range of heavy metals and agrochemicals. Nadia is a flood-prone district. Vast areas of the district get flooded every monsoon resulting in massive soil erosion. To combat the formidable problem of soil erosion, the state government came up with a solution of plating Vetiver grass along the banks of rivers Bhagirathi, Jalangi, Churni, Mathabhanga, Padma and Ichamati covering a distance of around 743 km. Nearer home, the traditional weavers of Anakaputhur turned to ‘vettiver’ as raw material for a fabric, after trying their hands at several natural fibres, including aloe vera, coconut husk, banana, and jute. They were marketing sarees made out of vettiver .. .. one may try them too. On the concluding day of Brahmothsavam is ‘Sapthavaranam’ – grand Thiruvaradhanam, rendering of Thiruvaimozhi and later in the night, there is purappadu in Siriya Thiruther [the small chariot]. Today, 21st Apr 2017 is the tenth day of Sri Parthasarathi Brahmothsavam at Thiruvallikkeni [Triplicane] divyadesam. It is ‘Chinna Thiruther’ famously known as ‘Vettiver Chapparam’… I had earlier posted of the scientific name of vetti ver as - ‘Chrysopogon zizanioides’, a type of grass of Poaceae family, native to India. Also known as ‘khus’ Vettiver can grow up to 1.5 metres high and form clumps as wide. This Ther is known as ‘Vettiver Chapparam’ – for there used to be so many sheets made of this grass placed on the temple car. One could feel the divine fragrance from a distance itself. Understand that the stem of the grass vettiver is cut, smoothened and made into a mat. 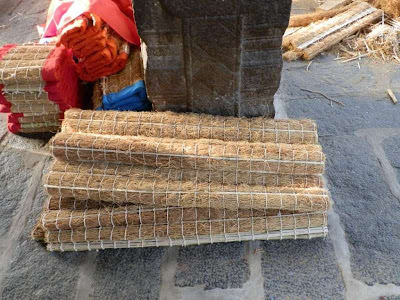 These mats were earlier even used in houses and as the air passes through it, there would be fragrance and natural cooling of air. (this time there was not much of vettiver though !). 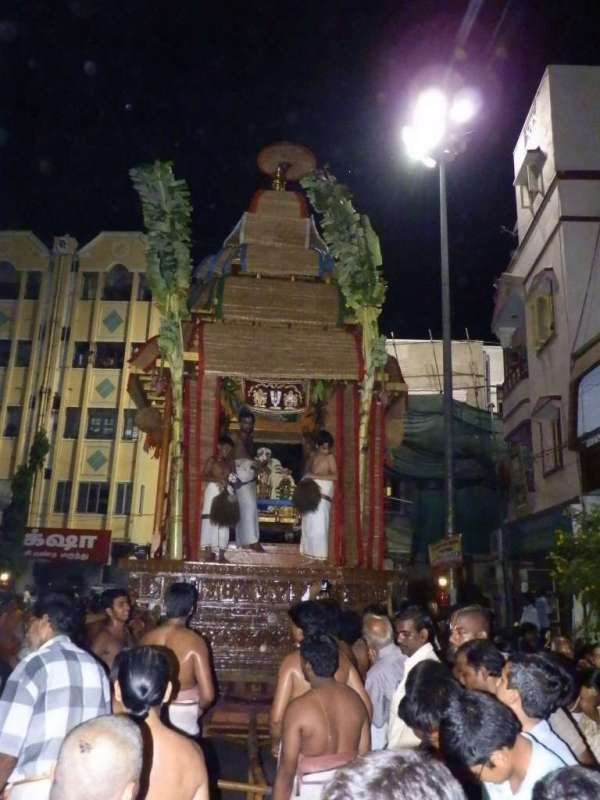 In the purappadu - Thiruvarangathu Amuthanaar’s ‘Ramanuja Noorranthathi’ was rendered. Here are some photos taken during the purappadu. a few years ago !